At this point in the season, Portland fans could have had 360 free McNuggets just for having the McDonald’s mobile app handy. Though I would not recommend consuming that many, as the six I inhaled less than an hour ago have me feeling a bit sluggish as I write this. Thinking about another 354 nuggets piled on my desk is not helping. The Trail Blazers, like many professional sports teams past and present, have partnered with a fast food chain to provide free items dependent on the team’s achievements. After each game that the Blazers score at least 100 points this season, fans with the mobile app will have the next day to visit participating McDonald’s stores and scan their code to redeem 6 McNuggets free of charge. 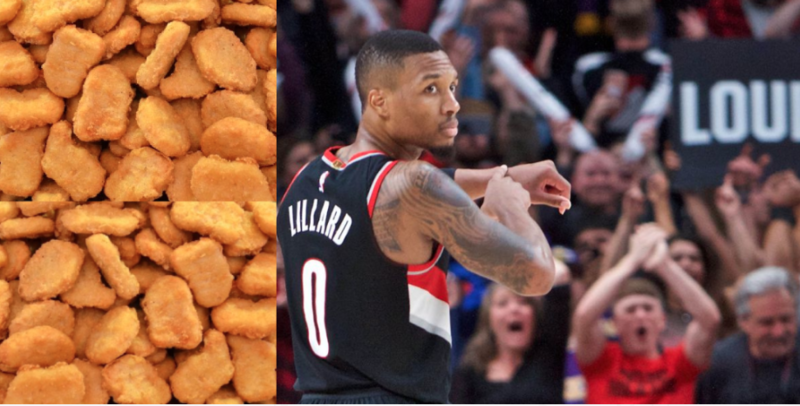 Blazers Fans could have picked up 360 free McNuggets so far this season. Spread out, this doesn’t seem like much. But when you consider that each fan could have claimed over 13 pounds of free chicken – it seems like a big deal. 216. oz = 13.5 lbs. Many franchises have similar incentives, with the most well known debatably being Taco Bell’s “Steal a Base, Steal a Taco.“ A promotion which runs during the Wold Series and allows all fans to get a free taco if any base runner successfully steals a base during the championship games. GSW: Probably the stingiest promotion of the season is for the fans whose team is currently sitting in first place of the Western Conference, the Golden State Warriors. Seeing as how the Dubs are the two time defending champs, it’s understandable that McDonald’s would bolster their defenses to not lose too much revenue. To do this, they are offering one order of Medium Fries to fans when the Dubs win *On the Road*. Worth Noting: The Warriors have 11 losses on the road. Through my research, I have determined the average number of fries in a Medium McDonalds order to be around 65. This means that the Dubs road losses have hypothetically cost each of their fans around 715 free French Fries.